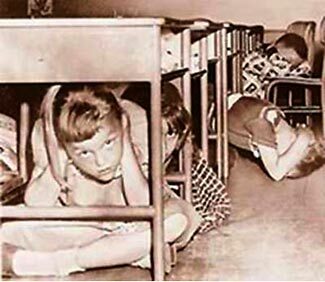 1950s school bomb drills were one way of prepping. Hopefully you adopt more effective methods. Neither threat is new, but both have been uttered again this week, and with more vehemence than before. Our good friends the Iranians (not!) are reputed to be preparing an army to launch against the US, waging war against the country’s infrastructure such as our power grid, water supplies, and other public infrastructure components. But this ‘war’ would not be fought on American soil, and wouldn’t see combat between our troops and theirs. This would be a cyber-war, with the Iranian forces being hackers rather than soldiers, and rather than risking their lives on US soil, they’d be attacking our systems from the comfort of their living room tables. The results to us would be the same. There’s no difference to us, as between dynamite bombs and logic bombs, when it comes to destroying the control system for a major power substation, a hydro-electric dam, or a water treatment facility. If when we turn the tap, no water comes out, or if when we flip the switch, the light doesn’t go on, we’re identically affected, no matter what the cause. More details about this threat here. The North Koreans also had a message of hate to share with us this week. Their top soldier – their Army Chief of Staff – claimed they had unspecified weapons that could ‘defeat the US at a single blow’. No-one is sure what this would be, and it may well be based more on rhetoric than real substance, but it isn’t a good feeling to have the top soldier of a country that is still technically at war with us to threaten to destroy us completely. Modern warfare is totally different to that of 50 years ago. Fifty and more years ago, warfare was low intensity, it occurred over an extended period of time, and the ultimate victory would almost invariably go to the country able to allocate the most men, money and industrial manufacturing to the conflict. With the US having by far the strongest economy in the world, and one of the largest populations, it was able to field huge armies and both supply and resupply its armed forces at rates vastly greatly than any opposing forces. Our ability to win any conflict that we fully committed to was close to assured. But these days warfare is high intensity and can be all over and done with in a matter of minutes (if nuclear), or days/weeks (if conventional). High intensity wars are not so dependent on a country’s economic strength or even its pool of available manpower, because the war is generally over and done with during the first round, based on the forces and material that the opposing sides have on day one of the conflict. There is no time to induct and train up and deploy more troops, there is no time to start producing more planes, tanks, and ships. The war has been won or lost well before then. With the US running down the size of its standing forces, with it reducing not only the number of planes, tanks and warships, but also its stocks of missiles, bombs, and even bullets, we no longer have an unstoppable lead up front. And even if we did survive the first round of a high intensity conflict, how long would it be before we could start resupplying? How long does it take to build a new warship? A year or more, sometimes five years or more. How long does it take to build a new plane? While a new plane only takes maybe a week on the assembly line, the real question is ‘how long does it take to build a new assembly line, and new factories to manufacture the sub-assemblies for the planes? The answer there is again measured in years, not weeks or months. The other feature of modern warfare is that it is like guerrilla warfare on steroids. The key thing about guerrilla warfare is the imbalance of forces. Traditionally, an attacking force needs to be two to three times the size of the defending force to win an encounter; with guerrilla warfare, tiny teams of men can tie up tens or hundreds of times more of the opposing force. The concept of guerrilla warfare on steroids is that whereas before it would have taken a team of maybe ten special ops soldiers days or weeks to hit each target in enemy territory, and they would have been vulnerable to enemy countermeasures, now it takes only one clever hacker perhaps no more than a few hours to destroy the control systems for the target that previously would have been destroyed by tons of high explosive instead. A hacker could wake up in his bed at home in the morning, then after breakfast work from his kitchen table. By lunchtime he might have destroyed multiple high value enemy targets, then after a comfortable lunch, he could repeat the exercise again for the afternoon, never having personally put himself at risk. These are the problems and these are the vulnerabilities the US now faces, totally like any threats of ever before. Our military might – such as it may be these days – is powerless to protect us against a ‘suitcase nuke’ or a biotoxin strike or a remote hacker. Oh – two more things. First – this type of future war won’t be fought on a distant battlefield in a far-away foreign country. For essentially the first time in our nation’s history, this war will be fought in the American homeland, and its casualties will be ordinary US citizens – people like you and me. Second – the overall vulnerabilities of US society magnify the disruptive effects of attacks on our infrastructure. The loss of power is more than no lights at home. It means no power for the factories that make the food we eat, no power for the hospitals, and so on and so on (okay, to be exact, most hospitals have emergency power systems that provide unknown amounts of power, of unknown reliability, for unknown periods of time, but you get our point). Back in the days of the wild west, the gun was referred to as the great equalizer. No longer was the outcome of a fight dependent on the person with the greatest physical strength. Even the puniest of men and the frailest of women could compete on equal terms, based not on physical prowess but instead on skill at arms with a gun. Today we have two new great equalizers. The first is computer hacking. For the first time in our country’s history, threats to our national security do not require a stronger country with a more powerful economy and a larger army; any puny little country with a handful of clever computer hackers could potentially bring us to our knees more quickly than a super-power with a 10 million man army. The second is the NBC threat : Nuclear, biological and chemical weapons. A drop of toxin in a city water supply, a suitcase nuke exploded downtown in the center of your city, or – worst of all – a single EMP pulse which could destroy most of the electronics and electrics of the entire country – these weapons are trickling down to smaller and smaller countries. The ‘nuclear club’ of countries that possess nuclear weapons, once the exclusive preserve of the US, UK, France and USSR, is now getting crowded with around ten countries now having nuclear weapons, and plenty more working their way towards that goal. And with tens of thousands of nuclear weapons ‘out there’ – particular those formerly belonging to the Soviet Union before it broke up, who’s not to say there are a few stray ones in the hands of evil doers. Chemical and biological weapon capabilities are even more widespread. If it isn’t already obvious – our country is massively at risk of man-made disruption – of ‘The End of the World as We Know It’. And with our fragile society and its lack of reserves and redundancies in supply lines and sources, any disruption will threaten much broader consequences. Whether such disruptions might take three months or three years to resolve becomes irrelevant when society starts to collapse after three days of disruption and is completely destroyed after three weeks. How long could you manage with no food, no water, and no utilities, and roving gangs of desperate citizens keen to take whatever you might still have from you, by force if necessary? We need to be prepping. Great commentary – I especially like the new concept of computer skills, or “hacking”, as being the new “great equalizer” of our present society. One observation I would like to make – I wasn’t sure of the best place to post this, so this is as good a place as any. While each of the individual types of disasters are bad enough in their own rights – i.e, if we ONLY got hit by a major natural disaster, OR an EMP attack, OR a terrorist attack using nuclear or bio/chemical weapons – it is even more likely that the EOTWAWKI will be triggered by a combination of several of these. From what I have read of the fall of major civilizations in the past, it was often a series of disasters that led to their ultimate destruction. For instance, while many people are under the impression the Roman civilization “fell” due to the invading hordes of barbarians from the north, that is not entirely true; after the invaders had sacked and looted the cities they attacked, they rode away to the north again (perhaps leaving behind a few who married local women and stayed), and Rome and the surrounding cities continued to muddle on for several hundred more years under the semblance of an “empire”, albeit a much reduced one. Natural disasters like Pompeii contributed to the decline, and the empire slowly shrank as troops were recalled from the farthest outposts to return and help defend the core of the empire. It was most likely the eruption of Krakatoa on the other side of the world, and the extremes in climate and resulting mass crop failures that were caused by this, that rang the final death knell for the Roman empire as the world knew it, and ushered in the feudal age — the very epitome of the Level 3 disaster with marauding bands of starving people that is frequently described on this website, and the reason people started building all those walled, defended cities and castles during the “dark ages”. My point is simply that, while any one type of major disaster MIGHT be able to be recovered from in a reasonably short period of time, especially of at least some parts of our country (or the rest of the world) remain intact, one can easily imagine a scenario like this: First, hackers (or several terrorists with portable bombs) manage to attack several of the major power plants in the US…many plants are still online, but the power grid is strained as the remaining plants have to redistribute their power to try to cover the affected areas. Since certain replacement parts are only made in one factory in one European country, and there is a three year waiting list, the plants cannot be replaced any time soon, so Americans are soon seeing rolling blackouts as a way of life. Second, another banking/financial disaster occurs, sending the stockmarket into a sharp decline or “crash”, and ultimately millions of people out of work. Government resources are spread thinner as it tries to “bail out” big banks while dealing with tent cities of homeless people which have arisen across the country. THEN there is an extremely cold winter, which wipes out many of the more sensitive crops, causing food prices to climb; THEN, another major hurricane which all but destroys another coastal city, further depleting the government emergency stores. You get the picture…after all of this, it only takes one more major disaster – or a reasonably strong foreign country to decide that now is the opportune time to invade the US and take over – before our whole society and infrastructure collapses like a stack of cards.